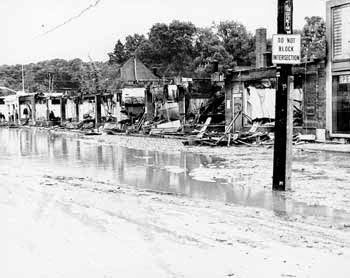 In in the late 1960s and an early 1970s a series of catastrophic floods of the Four Mile Run stream wreaked havoc on the Arlandria neighborhood, a working class neighborhood in the northeast corner of Alexandria, Virginia. At nearly 50 acres, Four Mile Run Park, the largest in the City of Alexandria, shared in the devastation. The subsequent flood control project instituted by the Army Corps of Engineers left behind a park with enormous promise but much of that remained unfulfilled after the floods were contained. Attention on the neighborhood and the park became refocused at the turn of the 21st Century with attempts to revitalize the neighborhood, restore the stream and refresh the park that reengaged the community toward self-empowerment. In 1998, citizens called to City leadership to begin two years-long planning processes to address the issues of the commercial district and the nearby stream. The resulting 2003 Arlandria Plan and the subsequent 2005 Four Mile Run Restoration Plan both called the expand the park and connect it to the neighborhood by acquiring underutilized commercial properties that abutted it along the neighborhood commercial thoroughfare, Mt Vernon Avenue. Further, the plans called to restore some of the environmental vitality of the Four Mile Run stream that would also enhance recreation while maintain flood control integrity. Alexandria used open space funds (from its 1% dedication of real estate property taxes driven by a grassroots effort) to acquire the 4 commercial properties in 2007 and immediately tore down some of the old buildings and engaged in some environmental remediation.Originally conceived as part of the 2003 Arlandria Plan, the Four Mile Run Expansion (4MR Expand) was incorporated into the Four Mile Run Restoration Plan adopted in 2005. The four parcels that had been acquired in 2007 with Alexandria City Open Space funds but sat idle for a number of years due to lack of money for planning and implementation. When budget crunches came on in the following years, the City government was about to give up and tear down the last remaining building, which the plans had hoped would serve as a showcase of environmental best practices and environmental educations. 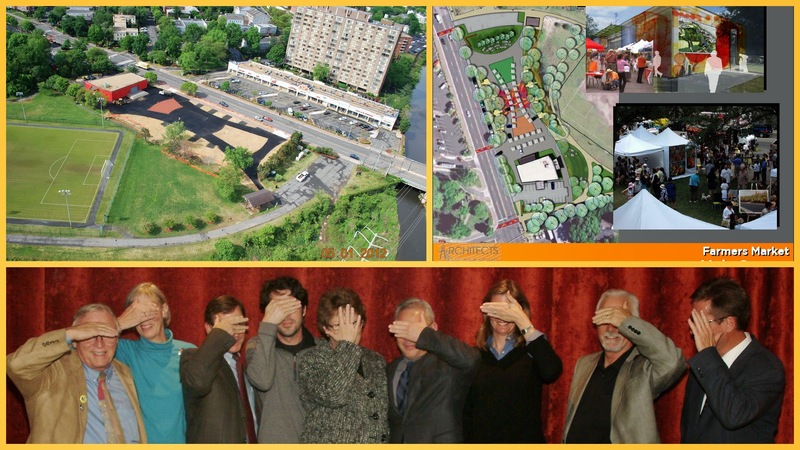 A group of area architects, citizens who had been involved with the planning processes, stepped in and donated their time to come up with a pro-bono concept for interim use and only funded with their donated time and materials, sweat equity and the funds that had been slated for the demolition. With the help of neighborhood activists, they later furthered their concept to include an interim park plaza in the vacant lots where the former commercial building had been torn down. The group of architects, known as Architects Anonymous, banded together to create a workable plan for the site that could rolled out over time making the best use of contributions from grants and the community. Soon after, the non-profit Four Mile Run Farmers and Artisans Market (4MRMarket) adopted the site as the site for a farmers' market and provided maintenance and financial contributions to further the project. Architects Anonymous contributed additional plans to re-purpose the former paint store at 4MR Expand and to prevent its demolition. The Arlandria Plan Implementation Group, a group of citizens commissioned to ensure progress of the plan, supported the project by requesting that the City help complete the community's vision by redirecting some ‘streetscaping’ funds that would have otherwise be lost. Since then,4MRMarket has solicited private contributions to enhance the site and the City's Parks department has coupled those funds with grants that they've solicited to create a venue to showcase the arts and environmental best practices. To date these include: a performance stage, permeable pavers and rain gardens to collect stormwater run-off. Planters to collect additional stormwater run-off and arts grants are still pending. 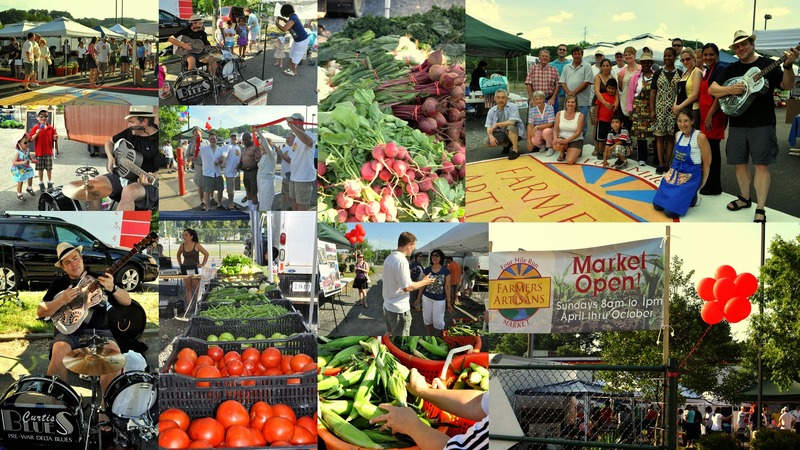 4MRMarket was founded to support the revitalization and expansion of Four Mile Run Park and to provide a local source of quality produce, meat, baked goods, prepared foods, artisan products and crafts to people in Alexandria, Arlington and beyond. 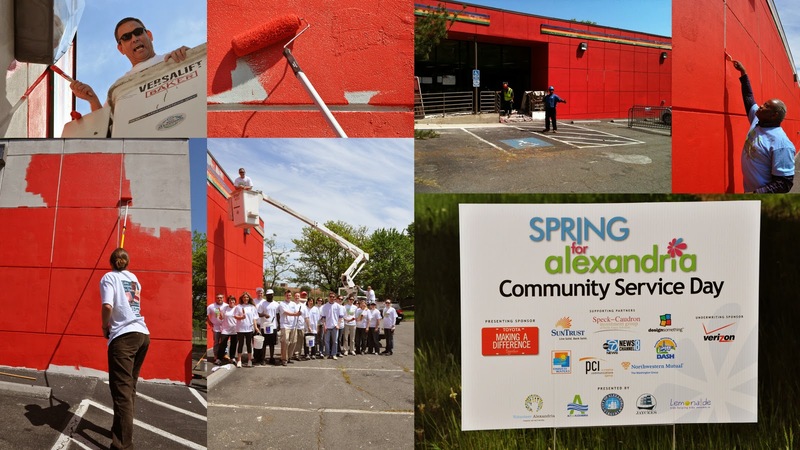 The market has worked with various community partners to create a venue that is inviting, clean, and a resource for the diverse neighborhood of Arlandria. As the first market in Northern Virginia to accept SNAP/EBT sales, market management has continued to secure double dollar incentives in conjunction with INOVA Health Foundation and the Alexandria Health Department to bring healthy food to people of all income levels. The market also accepts credit card sales using a token system, so customers can always use the "market ATM" when necessary. SNAP/EBT and credit card sales account for several thousands of dollars in sales during the season. 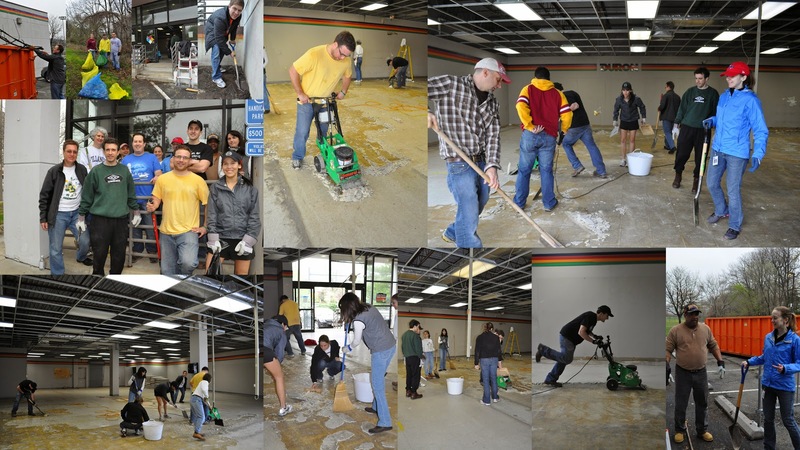 In addition to making financial donations, the 4MRMarket team has provided site improvements through "sweat equity" and by soliciting donations, both big and small. 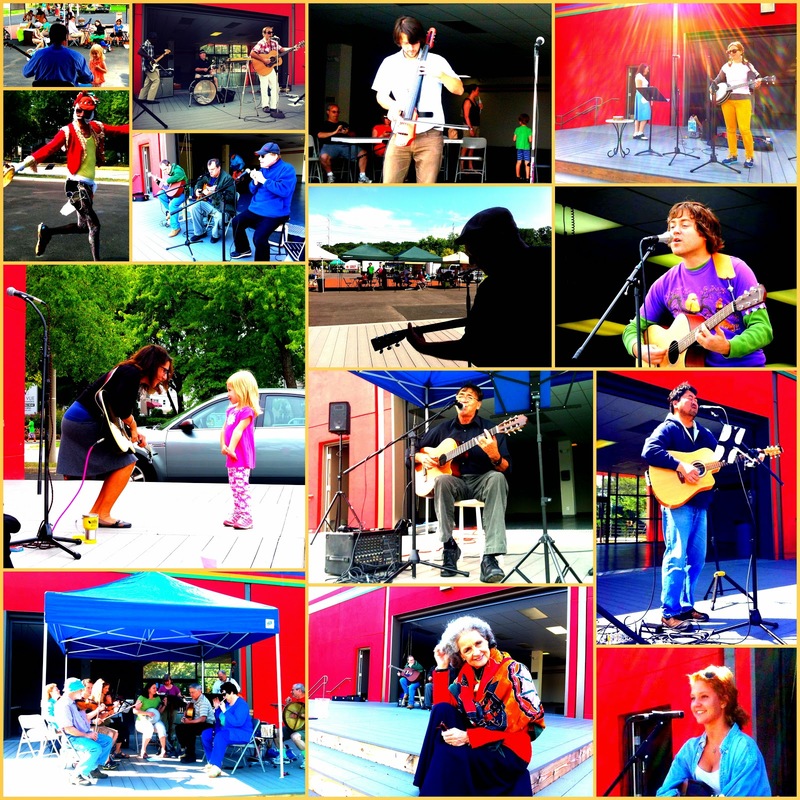 In 2012, an anonymous donation of $10,000 helped support a NEA grant to build a performance stage. Other private donations and grants are being sought to provide park furniture, a green roof, plant rain gardens and other park improvements. The efforts have received coverage on NPR. The same community activists have been engaged with park improvements at the other side of Four Mile Run Park. When the City of Alexandria purchased 3550 Commonwealth Ave from Virginia Dominion Power, they had Open Space funding available and a goal of expanding park space, but they didn't really have a plan for it. That wasn't a bad thing -- just removing the blighted, out-of-use electrical substation on the property and planting grass in its place was an aesthetic improvement -- but it left a blighted, vacant lot. While various options for the park remain open (there is community engagement process going on now), in the interim, a team of volunteers decided to start the process of turning the property around by installing a large garden on one corner. For just $200, using garden cast-off plants donated by neighbors and mulch from cut-down, unhealthy, storm-battered trees formerly used to screen the old substation, it started to resemble a park. 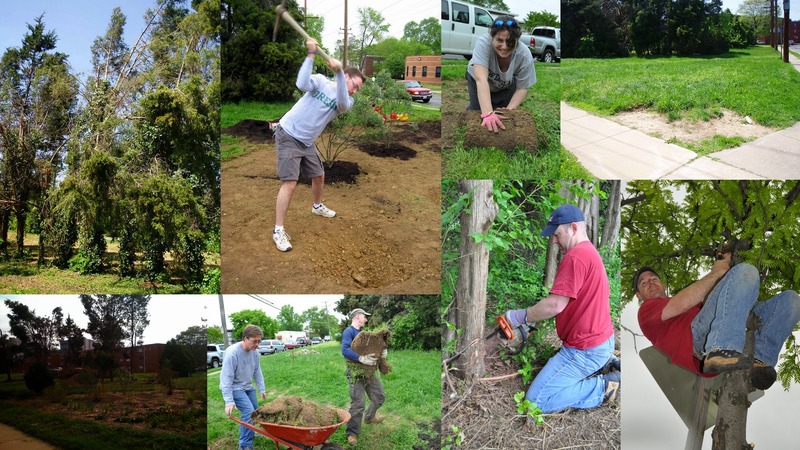 The neighborhood was able to build on the progress with volunteer efforts for City and power employees who each dedicated a day to work on the projects and with a on-going crew of neighborhood volunteers who continue to weed, clean, water and mulch. 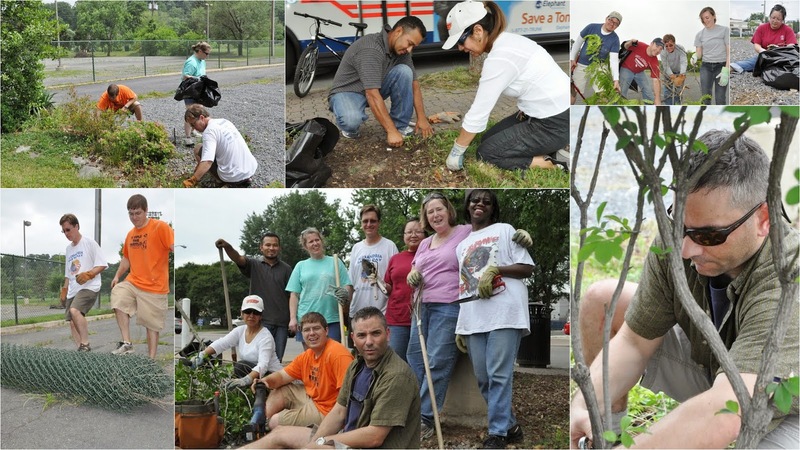 Without these volunteer efforts, the stalled park improvement might have continued the decline into blight. And there is anecdotal evidence that cleaning up the sites has improved safety: when volunteers were removing some of the trees on the site and thinning out the bottom branches of others, a woman expressed her gratitude for making the area feel more secure. She relayed the story of having her purse stolen by an assailant who had hidden among the trees and attacked her when she was waiting for the bus. Likewise, the site improvements have increasingly become self-policing: the more the sites have been continuously cleaned and improved on a sustained, albeit modest, basis, the less vandalism and littering has occurred. There have been boons in crime reduction, increase use of the parks, a general increased feeling of well-being and the beginning of investment interest in the commercial district. 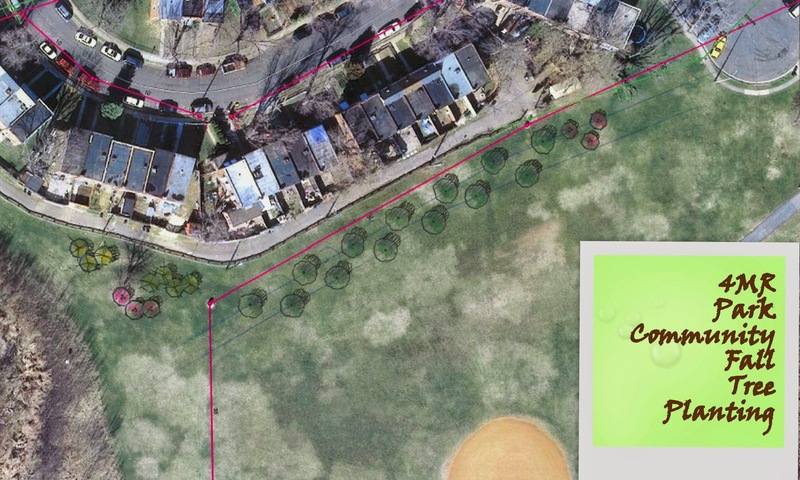 Over the past summer, in conjunction with the citizen-run 4MRMarket, the City of Alexandria launched its first-ever crowdfunding campaign to raise funds to kick-start the recently adopted Four Mile Run Park Improvement Plan by planting new trees in the park. Citizens responded with contributions large and small by donating tax-deductibly via the crowd-funding website. With the arrival of tree planting season, over a dozen new trees are to be planted in the first week of November in the portion of Four Mile Run Park along the Mark Drive alleyway.. Additionally, citizens have partnered with businesses to restore the interpretive environmental signs along Four Mile Run and tributary streams. A "friends of Four Mile Run Park" group (the Four Mile Run CONSERVatory) is being formed to continue the work into the future.